Eighteen members participate in Central Oregon District Leadership career event. 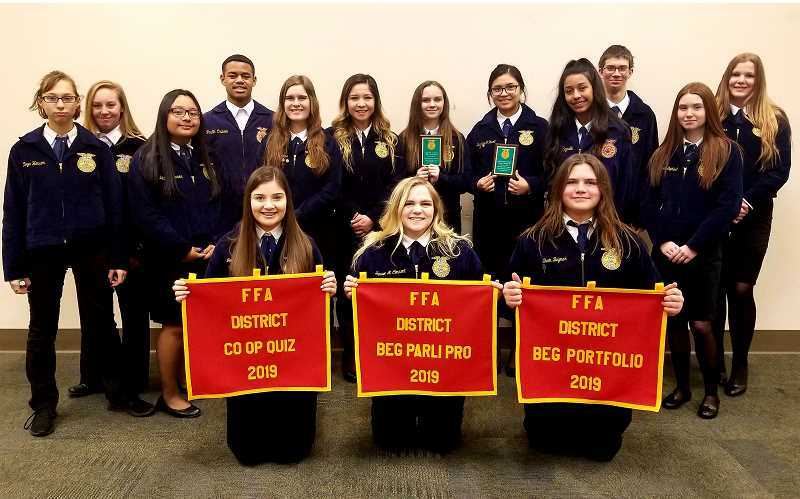 Eighteen Madras FFA members competed at the 2019 Central Oregon District Leadership Career Development Event in Redmond on Jan. 28 and 29. "We had some strong competitors and walked away with three second-place banners," said advisor Sara Vollmer. "Our Beginning Parliamentary Procedure team will be representing Madras at the Sectionals Leadership CDE in Bend on Feb. 25." The team includes President Bailey Dennis, Vice President Aspen Holcomb, secretary Taylor Foster, treasurer Emma Shierk, reporter Yoana Valerio Marin and sentinel Jessica Bruised Head. In the competition, teams are asked to argue a list of topics using their knowledge of parliamentary procedure. Students study a universal list for the state each year and learn arguments pertaining to the topics in order to debate. Shain Beymer received second place Beginning Agriculture Portfolio. Portfolios contain documentation of the member's FFA activities, activities outside of FFA and academics. The participant must meet certain formatting requirements when compiling the portfolio. Jensen Comment received second place in the Co-op Quiz and will be representing Madras at the Oregon State Convention by competing in the state level contest. The Co-op Quiz tests members' knowledge of agriculture co-ops and how they operate. On the state level, the contest consists of not only a written test, but an interview as well. Also, Comment and Amber Simmons completed all the requirements to receive their State FFA Degrees, including an interview and presentation. In order to receive a state degree, individuals must have already obtained their chapter degree, been an active member of FFA for a minimum of two years, taken a certain amount of agriculture classes and met certain requirements pertaining to each student's Supervised Agricultural Experience, such as a show animal. Beyond that, the members are also required to meet minimum GPA requirements, complete 25 hours of community service and participate in other school or community activities. The degrees will be awarded at the Oregon State Convention in March at the Deschutes County Fairgrounds. Everyone is invited to attend the ceremony.